QAnonTalk.com: #QAnon Tweets by @ZumaDogg for 03.05.18 - HANG ON FOR A WILD RIDE THIS WEEK: First Signs of BOOM BOOM BOOM BOOM Being Lowered=4 Deep State Assets GOIN' DOWN! #QAnon Tweets by @ZumaDogg for 03.05.18 - HANG ON FOR A WILD RIDE THIS WEEK: First Signs of BOOM BOOM BOOM BOOM Being Lowered=4 Deep State Assets GOIN' DOWN! #QAnonTalk: #QAnon board posted all new #memes, today. I tweeted a variety of my faves/most relevant/newsworthy ones. All HERE:mobile.twitter.com/ZumaDogg/media RT These are created by#Anons for OFFICIAL CAMPAIGNS. Copy and tweet on your accounts with appropriate #. I see u r into this/passionate/a digger. BOOM BOOM BOOM BOOM=lowering the BOOM on #Obama's #MuslimBrotherhood. 4 steps taken across the world. 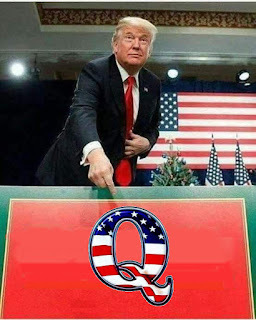 Q=intelligence. NOT bomb booms.#MyTheory based on Q Anons. AND, 1A=1stAmendment and YEAH, the 23 companies. Which is 5th on list? Anyone notice no tweets from @Snowden in 6 days. Is that typical for him? He's probably watching Jimi Hendrix LIVE, tonight. Maybe Elvis. #QAnon DECODE: #SingleAlgorithm=#DeepState had @Snowdendesign a #CENSORSHIP algorithm. #DeepState controlled#Google/#YouTube/#Twitter/#Facebook had SAME ALGORITHM installed on ALL their platforms=No matter WHERE you go=SAME ANTI-#MAGA CENSORING. ANTI-TRUST SUIT FILED=LAST WEEK. #BOOM refers to put the BOOM down on the people Trump joked about at Grid Iron Dinner. No video allowed. But, I'm sure who he joked about is known. I think Schiff, for one. Trump's speeches send messages to #Q. TONS of cat pics to go through on #Facebook/shows to catch up with on #NetFlix/and I heard Jay-Z said something (gotta check it out)=I'm glad #Google/#YouTube/#Twitter/#Facebook has diligent staff making sure internet is safe and fake-news-free, for me=Some staff WENT TO HARVARD! #QAnonTalk w @ZumaDogg -- World News Weekend Review: 2 SHOWS: Q will be revealing REAL #ParklandShooting scenario. CRUZ is innocent. Sheriff had Black Op do shooting. Plus, MORE: 1)twitch.tv/qanontalk/v/23… 2) twitch.tv/qanontalk/v/23… RT!